Stockwell Park High School has launched a new intiative called the Black Rose Foundation. Inspired by the Poppy Day appeal, students at the school devised the multi-layered scheme: The Black Rose Badge, which can be worn to commemorate young victims of knife and gun crime. Wearing it symbolises a commitment to opposing violence. 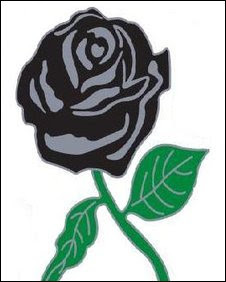 Black Rose Month will be celebrated annually. The Black Rose Foundation will raise money to fund grants and bursaries for young people to develop creative, sustainable projects. The launch event was held at the Oval on Tuesday 3 March when Stockwell Park students presented their project to an invited audience. Email enquiries about the Black Rose Foundation to theheadteacher@stockpark.lambeth.sch.uk or phone 020 7733 6156 ext 222.
bbc.co.uk also picked up the story. Hat tip to Bathsheba at Stockwell News.